How far would you go for the one you love? That is the question Ryan Rayburn must ask himself after his wife, Aryn, is abducted. Though the couple is in the midst of a separation, when word of her disappearance reaches him, Ryan launches his own investigation. Upon his return to their home in Chapel Port, Ryan uncovers a clue that only he can decipher, and it sets him on an adventure across Bishop's Island. Since its settlement, Bishop's Island has been shrouded in mystery. Nathaniel Bishop built his empire on the Pacific Northwest island in 1873 by oppressing his fellow islanders. Three heroes led an uprising that brought Bishop and his henchmen to justice. For six generations, the citizens of the island have tried to bury the past, while the bloodlines of the first epoch have remained interconnected. Few know the legends better than historian Aryn Rayburn, the foremost authority on Bishop's Island. 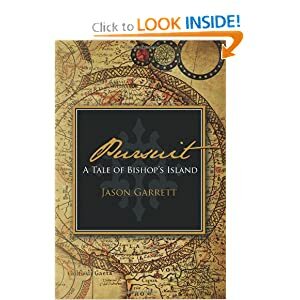 As a descendent of one of the families responsible for overthrowing Bishop, she learns that her abduction is connected to the very secrets on which the island was founded. Relying on remarkable intelligence and the faith that led her through a life-altering tragedy, Aryn, once again, must test her own strength as she risks her life to protect a secret she is more deeply connected to than she ever realized - a secret that, if revealed, could prove catastrophic to those she loves the most. The citizens of Bishop's Island welcome you to join the PURSUIT ! This book was intriguing, compelling and engaging. The book kept me on the edge of my seat and made me continue to wonder, what could happen next as any good book should. The author also does an amazing job at developing his characters and story line. The book is one in which the the author has taken intricate life circumstances and interweaved them into a tapestry where you wonder how it all will come together in the end and amazingly enough it does! The book also is one that will make you think about what is being said and better yet what is being left unsaid. You will be encouraged to root on the characters and be inspired by some as well. All-in-all this is a great book and one that I would highly recommend!